What does it mean when you finish a movie by saying, “Well, that’s better than I thought it would be.”? 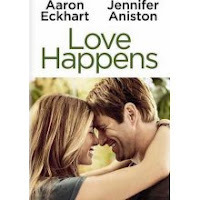 In the case of Love Happens, it means the marketing department was more concerned about selling this as a flighty, light-hearted romantic comedy rather than what it truly is: a somewhat quirky, thoughtful, sweet film. Aaron Eckhart stars as Burke Ryan, a self-help psychology guru specializing in grief, who is in fact drowning in his own inability to deal with his wife’s death. I found Eckhart charming and vulnerable, and was reminded how this actor seriously needs more press time and starring roles. Jennifer Aniston is Eloise, a local florist Burke meets during a week of seminars he is leading in Seattle. Eloise is an earthly foil for the polished Burke, but her character is so shallowly drawn it’s hard to fully invest in her. That’s alright, though, because the story really belongs to Burke – the lies he’s told himself and others, the people he tries to save when he can’t save himself, and the coping strategies he’s adopted over time. I loved the look, feel, and sound of this film, accomplished through fabulous cinematography and scoring. I laughed out loud at some unexpectedly funny moments, and cried when Burke awakens to his own falling apart. Love Happens is not romantic dramedy at its most brilliant (for that, watch Dan in Real Life), but it will pull at your heartstrings without managing to insult your intelligence. Rated PG-13 for some language, including sexual references. 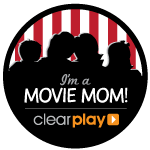 Motherly Advice: ClearPlay could easily remove the few scenes with mild language and sexual innuendos, and certainly the one scene of the characters smoking a hookah pipe at a club (now, why did the movie “need” that scene?!). Even without the filters, though, I would be comfortable allowing my teens 13 and older to watch this film.